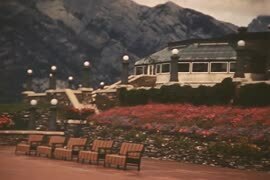 Film depicts various shots of what appears to be Banff, a number of shots of people golfing, shots of Kelowna in the summertime, and shots of men with their fishing catches in Port Alberni. 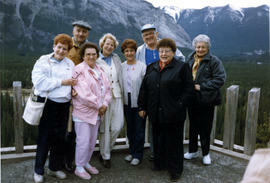 Photograph depicts a group of men and women standing together, with mountains in the background. Photograph depicts Lake Agnes and Mirror Lake, from the heart of the Rockies.Treed, rocky mountain slope in foreground of image; two small mountain lakes in bottom left; snow covered rocky peaks in background. Photograph depicts Lake Louise.Foliage in front of placid lake surface in foreground of image; rocky slopes with glacial deposits culminating in ridged, rocky peaks with partial snow cover in background. Photograph depicts a mountain and trees reflected in water.Mountain and trees reflected in placid lake in foreground of image; foliage and trees extending off bank and into water; rocky, jagged, snow capped mountain in background. Photograph depicts a lake and mountains.Reflection of mountains in placid lake in foreground of image; snow covered evergreen trees in right of image; snow covered, rocky mountains in background.